Horses are large hoofed mammals that are closely related to donkeys and zebras. The horse evolved over the past 50 million years from small multi-toed creatures to the large single-toed animals they are today. 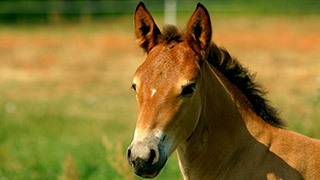 Humans started to domesticate horses around 4000 BC and today the only true wild horse species left is the endangered Przewalski's horse.